Now that I'm back to commuting for work, I'm focusing more on my budget. Something that I've been lacking over the last year or so. Just like diet & exercise we all need to work on keeping our finances in line. Just like diet & exercise when we keep on it with our finances we see continuous improvements. And just like diet & exercise who we stuff off a little with out finances, it's easy to lose all our gains and go back into our bad habits. While I've been doing okay, I now need to get back in tight control of the checkbook. A tank of gas will no longer last me a week. And with the drive, I had to upgrade my ride a little before I wanted to. Now there is a car payment thrown into consideration. The other weekend I was out doing the weekly shopping and knocking a few items of the Christmas gift list. I found myself in the coffee maker aisle of an area big box home improvement store. My old coffee maker was on its last leg and it was past time to replace it. And a sleek looking stainless steel number had my full attention. Tons of features and tons of options. 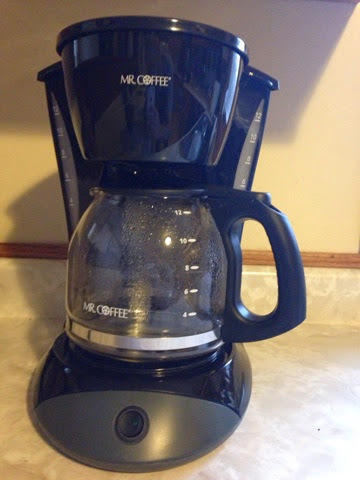 Timers, brew strength settings, self cleaning mood, brews a twelve cup pot like grandpa used to do, or a single cup using those little flavored plastic cup thingies. As I was trying to justify the price tag of the coffee maker to myself, I was already accessory shopping for it. They conveniently had a matching stainless steel organizer for the little flavored plastic cup thingies. As I was replacing and accessorizing half my kitchen in my head, a nagging little item wiggled it's way back into my head. My budget. And my budget had no room in it for a decked out coffee maker. I stood up to my inner child and told it no. The excel spreadsheet I made to get control of my budget clearly pointed out that a $100 coffee maker is not happening. I reminded myself that I don't need a button to adjust the brew strength, I can just put in more or less coffee. And since I make it the same every time, why would I need that setting for anyway? I told my inner child that since I rarely drink coffee in any other flavor than coffee, so the why bother with the little flavored plastic thingies and the sleek stainless steel organizer they would require. Sure a custom single serving of coffee flavored to their choice my impress a guest. But if I'm already making the coffee, there is most likely no need for me to do anything to impress them in the first place. The inner child pouted as I placed the no thrills $15 coffee maker into the cart. But the inner child doesn't add any revenue to boost the budget. And until it finds a way to do it, all it gets is boring coffee flavored coffee from a boring coffee maker.